If you prefer to travel with your pet rather than set them up in a local kennel, you need to consider is their transportation. In this NOZTONOZ Soft-Krate Pet Home review, we’ll be taking a close look at the product and its benefits. This is a very durable and useful soft crate that is ideal for both indoors and outdoors, and for both small and large dogs. Ideally, you want to find a pet home that your dog is going to love. Once they feel at home, it is so much easier to travel from A to B whenever you want. You also need something that is strong, sturdy and built to last. The NOZTONOZ Pet Home has some useful advantages for any pet owner. They include being pretty easy to set up, something most people look for. The last thing you want to mess around with after a long journey is putting up your dog’s little home in the new location. If you don’t want to choose a standard crate for your dog and need a pet home that is easier to handle, this is well worth a closer look at. CLICK HERE to Read FAQs, Customer Reviews, and to Buy it on Amazon! 1.2 Which Sizes and Colors Are Available? 1.3 What Are the Advantages & Disadvantages? 1.5 Is It Suitable for Dogs That Chew Plastic and Fabric? 1.6 Can You Take the Soft-Krate Pet Home on Flights? 1.8 Who Should Get the NOZTONOZ Pet Home? 1.9 Should I Buy It? In this review for the NOZTONOZ Pet Home, we’ll be looking at all aspects of the product. That includes who it’s suited for, what sizes are available and the pros and cons of buying one for your pet. They are a small company that specializes in a few different designs for pet homes. Based in Blacksburg, Virginia in the USA, they produce a soft crate that comes in several different sizes and which has been a favorite with customers for a few years now. The range of different sizes means you should be able to find a portable home for any dog from small ones like chihuahuas to reasonably large breeds like Alsatians. Which Sizes and Colors Are Available? 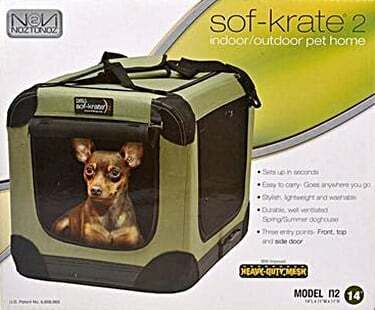 The smallest Soft-Krate Pet Home measures 21 inches by 15 by 15 and is suitable for dogs up to about 15 pounds. That includes breeds such as Chihuahuas and Shih Tzus. The biggest pet home is 42 by 28 by 31 inches and suitable for much bigger dogs including Labradors and German shepherds. There are three other different sized pet homes in between these models. That’s enough to cover practically every breed of dog. 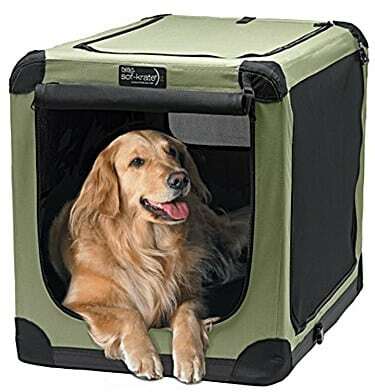 The pet home only comes in one design color, a khaki green with black piping and corners. If you’re looking for something that is purely functional, then this shouldn’t be a problem. CLICK HERE to Buy the Sof-Krate on Amazon! Picking the right option for your dog involves considering the price, size, and sturdiness of the build. If you’re always traveling, for instance, your going to need a product that you can put up and take down pretty easily. Here’s a quick guide to the pluses and minuses for the NOZTONOZ Soft-Krate Pet Home. This is a highly durable and well-ventilated home that can be used outdoor or indoor. It’s easy to put up and take down. The soft material and wire framework mean that it can be constructed quickly. It incorporates a tight weave mesh that not only provides plenty of ventilation but protects from the elements at the same time. You can choose to unzip the sides and top of the crate and the front rolls up and down to allow your dog easy access when in place. It’s portable so you can fit it into your car on long journeys and provide your dog with a secure and safe place to rest. The water-resistant base means that your dog won’t be left feeling uncomfortable during wet weather outdoors. It’s easy to clean, and you can dismantle and put in the washing machine or use a damp cloth to clear up smaller messes. There is not a screen on top of the pet home though it can be unzipped and pulled back. If you have a dog that likes to chew, they can get into the mesh and damage the pet home, so it’s not suitable for their long-term use. This can be a problem if you have younger dogs who are not entirely house trained properly. When it’s first unpacked, you may notice a strong odor from the new material. This is nothing to worry about and tends to dissipate within the first couple of days. Overall, there are a lot of positives for the Soft-Krate Pet Home, and there’s no doubt it’s suitable for practically all breeds and size of the dog. The cost is mid-range for portable pet homes, and you can expect it to last a good while. It’s well worth the investment if you want something that is light and portable. It is available in a range of different sizes and is simple to set up wherever you are based. It’s a good buy if you want a portable and secure home for your dog, whatever its size. Let’s take a quick look at what customers who bought it have been saying about the product recently. According to many buyers, this is a great home for those dogs that are already crate trained. The large sizes available and the wire frame make it sturdy and suitable for indoors and outdoors, even for big breeds. Many customers have used it as a home for their dog as they travel across the country. It’s easy to fit into any car and can easily be secured. Traveling with your dog and using a Soft-Krate Pet Home has certain advantages. The fact that you can open up three different access doors means that you can position the home in your car or caravan and still have sight of your pet. That’s good news if you need to keep them calm during your journey. Most buyers like the fact that they can transport the pet home from place to place. Dogs can often get nervous when they’re somewhere new so having something they recognize and feel comfortable with is important. If you’re staying in a hotel, for example, it’s a simple case of transferring the pet home from the car to your hotel room. Durability is also another thing that customers have commented on with this product. One owner bought their Soft-Krate Home over six years ago, and it’s still in pretty good condition. That’s great news for anyone that is looking for an affordable but long lasting solution to their pet home problem. The trouble with hard, metal crates is that they can be a big problem if you want to move them in and out of a particular location. If you are a regular traveler, for instance, then having a pet home you can easily flatten down and store away is vital. The Soft-Krate is also pretty light compared to your average metal cage. For those that want their pooch to have a personal space, this pet home fits the bill entirely. It can be set up in any home, near your dog’s favorite spot or even outside where it will be able to cope with most weather conditions. Most dogs learn to settle down with their new space and go to it automatically when they’re being put to bed. Customers also point out the good ventilation with the Soft-Krate which means that the product can be used in a variety of different locations. As we all know, a good flow of air is essential for any dog, whatever their size. The last thing you want is an enclosed space where there’s a lack of air, particularly on a hot day. If you are always putting your dogs in the back of your car and want to have more control over them, the Soft-Krate delivers on all points. They are simple to install and put up in just a few seconds. They provide a safe space for your dog as you drive to the park and helps keep them calm. Especially if you have a couple of excited dogs, you can keep them under better control by putting in two of the pet homes. Big dog lovers tend to love this kind of product more than many other customers. Many have many dogs, and a product like the Soft-Krate is perfect for households with plenty of pooches. They don’t get crashed around like metal or hard plastic pet homes, and they’re easy to set up and take down if needed. Other customers who like to keep a clean home love the fact that this pet home product is so light. It’s easy to wash, and so you don’t end up with a space in the home that smells too much of dog. The majority of reviews of the Soft-Krate Pet Home are very positive, and that’s a testament to the durability and flexibility of the product. It’s often a safe space for dogs of all types and has even been used by owners when their pooch is recovering from an operation at the vets. Is It Suitable for Dogs That Chew Plastic and Fabric? While the crate has a strong steel frame, if your dog is highly prone to chewing and won’t leave your pet home alone, you may like to look at a sturdier product on the market. This can be the case with both small and large dogs, so it’s worth checking them out in the first few days if you have decided to buy the Soft-Krate. Biting and chewing is usually a trait that you get with younger dogs, of course. You might want to try a few simple tips such as giving your dog something to chew and make sure you take it for a lot of walks to tire it out. If you do find your dog chewing its new home, the best thing to do is take the crate down and address the behavior first. Most dogs, as they grow older, also grow out of the chewing habit. Once they’ve become calmer and are less likely to sink their teeth into things, you can then put the pet home back up again. Can You Take the Soft-Krate Pet Home on Flights? This is not a pet home that is suitable for carrying on board flights, even for the smaller models. It doesn’t meet current airline restrictions for pet carriers and is more of a home than a carrying product anyway. If you are looking to transport your dog or another animal, we advise you to search for a more suitable carrier. The Soft-Krate can be dismantled and flattened to be packed away and used at the other end of your journey. That means you can take your carrier on the flight with you, just not with your dog in it. The main thing that you will need to decide before you buy the NOZTONOZ Pet Home is which size to pick. The manufacturers suggest that you take a few measurements for your dog first so that you can gauge which of their five different sizes you should buy. The first step is to measure your dog from the top of the head to the floor. Ideally, you want the height measurement to be just a few inches more than this as your dog will not be spending much of their time standing. They will need a little headroom, however. The next step is to measure your dog from the tip of the nose to the base of the tail. NOZTONOZ recommend you should choose a pet home that is about 4 to 6 inches bigger in length and width than this measurement. This gives your dog more than enough room to settle down and feel comfortable. Dogs don’t tend to like too much space as they prefer to feel protected on all sides. It’s primarily because they are den animals. That can mean choosing a larger pet home for a smaller dog is not always a good idea. If this is what you have chosen and your pet is not that interested in your new home, reducing the space with a few toys, and other things might make it a more enticing space. Who Should Get the NOZTONOZ Pet Home? This is a high-quality pet home that is most suited to dogs but certainly has been used for cats and other four-legged animals. It’s not a carrier and shouldn’t be used as such, even with smaller dogs. The key is picking the right size for your pooch, and that means measuring them accurately. Many customers have bought it as a stable place for their dog to rest in the home. Others buy one because they are moving from place to place quite often. If you travel regularly and want to take a pet home with you that is easy to erect, store in the car and take down again in a matter of seconds, this is a good choice. Some dogs don’t like pet homes that are made of hard materials like plastic or metal. The softer material of the NOZTONOZ pet home can seem a lot more comfortable and great space where they feel safer. A bit dog moving around a metal pet home can also be quite noisy. You don’t get that problem with the Soft-Krate. There’s a lot to be said for the Soft-Krate Pet Home which is why it’s such a popular choice for dog owners across the U.S.
For even the messiest dog, this is a product that is easy to clean – you pop it into your washing machine. For smaller mishaps, you can get out a cloth and wipe the material down. You have with the Soft-Krate a product where you can use it both inside and out of the home. The waterproof base means that you won’t be prone to flooding if it rains. 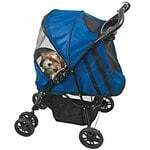 It’s perfect for your dog’s favorite spot or keeping them protected if you want them to sleep outside of a night. Finding a top-quality pet home is not as easy as many dog owners will tell you. There’s a lot out there to choose from, and not all of it is top quality. 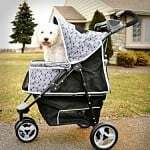 If you are looking for a durable and light but collapsible pet home that is both affordable and which your dog is guaranteed to love, however, the NOZTONOZ Soft-Krate is well worth the investment. CLICK HERE to Buy Your Soft-Krate Pet Home on Amazon!